Cost to install a concrete countertop varies greatly by region (and even by zip code). Get free estimates from countertop installers in your city. Cost to install a concrete countertop varies greatly by region (and even by zip code). The average cost of installing a concrete countertop is $3,000. How much does it cost to install a concrete countertop? If you’re considering installing a new countertop, know that concrete countertops are becoming increasingly popular. Almost every aspect of concrete countertops is customizable and in some cases the countertop can become a unique work of art. This is definitely not recommended to do it yourself. A professional understands how to work with specialized concrete to create a product that will last. For a 30 square foot countertop with sink cutout and mid-level customizations and installation, you’ll pay $3,000. Concrete, like any countertop material, has its pros and cons. Infinitely customizable, large variety of colors. Easy to create a unique shape. Compatible with many different kitchen and bath styles. Susceptible to scratches and stains. If you’re replacing an old countertop, it will have to be removed before the new one can be installed. 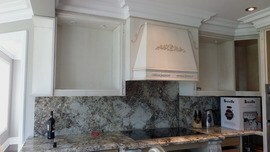 The old countertop needs to be disassembled and separated from the cabinets without harming the cabinets underneath. It will take a carpenter 4-16 hours to remove the old countertop, depending on the material, and will cost on average $70 per hour for a total of $280-$1,120. The concrete installation process is labor-intensive, and it has the potential to create a mess during installation, particularly if it is poured on site. Concrete, in its raw form, releases dust, and as a result, all cabinets will need to be covered with plastic to protect the surface. As part of the construction process, a test form will be created to ensure that the color mix, pouring consistency, and aggregate mix are correct before pouring the whole slab. Your contractor will also need to take measurements ahead of time in order to build the correct mold for your countertop. If you want to take your own measurements, measure the depth of your current countertop and the length of each “section” of countertop. For example, if you have an ‘L’-shaped countertop, you’ll have two sections to measure. Also measure the height of your base cabinets. Part of what makes concrete countertops so appealing is their color and texture. Concrete countertops have the immediate ability to draw attention. Concrete is incredibly versatile and can take on many shapes and colors. 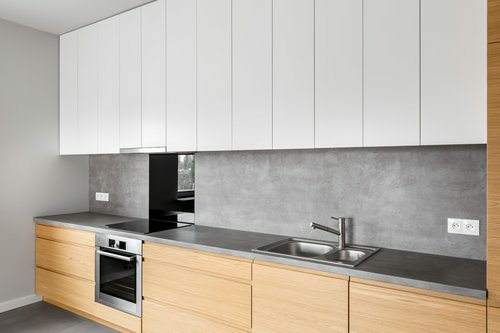 Concrete countertops can vary significantly in terms of size, and some countertops may need to be made in pieces depending on the shape of the final countertop. Countertops with unusual shapes like curves will cost more, often around $100-$135 extra per square foot. In terms of thickness, most countertops are 1.5-2 inches thick, but the thicker the countertop, the heavier it gets. Ordinarily, concrete weighs about 18 pounds per square foot, which is comparable to granite. It may be constructed with built-in 1 reinforcements, but the slab itself does not typically need reinforcement upon installation. Thicker countertops are made with glass fiber (GFRC) aggregate to make them lighter and stronger. Chamfer: the top quarter of the edge is cut at an angle. Eased square: the edges are slightly rounded to avoid gouging and chipping. Ogee: an ornate edge with concave and convex curves. Bullnose: the edge is completely rounded. Chiseled: the edge looks raw and exposed. Countertops serve many different purposes and can take on many interesting varieties in their final form. There are several different types of concrete countertops. This is the no-frills option. The concrete is poured into a mold and cured, with minimal variations in edging and surfacing. Expect to pay $65-$90 per square foot. If you want to go beyond the basics, you’ll want to consider additional options. Concrete is amazing in that it can take on practically any color, and you can achieve different finishes to truly turn your countertop into a work of art. Unlike pigment, the stain is applied to the surface, changing the color or pattern of the concrete. One gallon of concrete acid stain costs about $70. 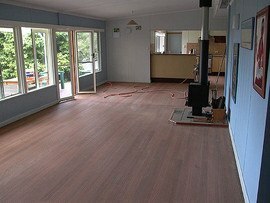 You would want to hire a contractor who specializes in the application of this product. Pigment is added to the concrete mix, creating a uniform color. Many contractors already have pigments to work with, but the price for 5 pounds of pigment is about $30. The concrete slab 3 is created off-site and is delivered to your house. Off site, the contractor will either use a pre-constructed mold or build a new mold, put in reinforcements, and mix the concrete, adding pigment and aggregate. The cost of installation is built into the cost of the countertop, so it could range anywhere from $65-$135 per square foot. The concrete slab is poured at the site of installation. This can seriously impact the use of your space, as the countertop needs to cure for several weeks. In addition, the process of building a concrete countertop is messy. This is usually the DIY route and is not recommended for a conventional installation. The process starts with measuring your countertop area and accounting for unusual shapes. A mold either already exists or is constructed for your particular countertop. The mold may need to be custom-produced, and then the concrete will need to be mixed. This process may include hand-placing custom stones like glow-in-the-dark stones or recycled glass. 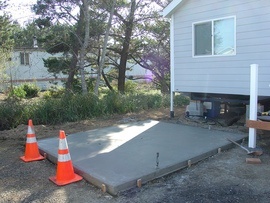 After the concrete is poured and the exterior stones are in place, the concrete will need to cure for at least a week. The longer the concrete is allowed to cure, the stronger it gets. After the curing process, the countertop will need to be finished, and will take on anything from a honed to a highly polished finish. The countertop will then be delivered to your home and installed. It will take a team of professionals to install, and the price of the concrete per square foot includes the price of labor. You will want to hire a contractor who specializes in concrete countertop installation. Concrete is a labor intensive process and can take anywhere from 4-10 weeks to complete. If you already have the countertop and just need installation, you can expect to pay anywhere from $10-$30 per square foot for the installation, which will take about 2-5 hours. Concrete requires regular maintenance in order to keep it looking as beautiful as it did when it was brand new. It needs to be sealed upon installation, and again every 1-3 years. Different contractors prefer different brands of sealer, but the sealer will have to be food safe. In addition to sealing, you should visually inspect your countertop periodically, maybe once a month or whenever you do a deep clean. Hairline cracks may appear in the concrete, and you can hire a concrete contractor to repair any cracks if they occur. Avoid abrasive cleaners, as they can cause scratches and damage to the sealer. Also avoid contact with acidic liquids like wine, citrus juice, and vinegar. 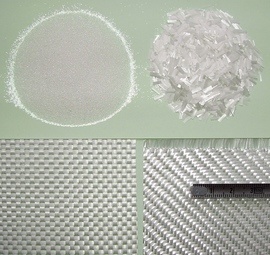 Acids can cause the surface to etch and lose its finish. Applying wax to the countertop regularly will help protect it over the long run. Granite countertops are incredibly popular, but concrete is rapidly gaining favor. Here’s a comparison chart to see what sets them apart. Backsplashes 4 are common additions to concrete countertops. Expect to pay the same per square foot for the backsplash as you would for the countertop, about $65-$135. Concrete countertops need to be sealed to avoid moisture leaking into the concrete and creating stains. There are different types of sealers, and contractors usually have a preferred sealer. Many concrete sealers will cost about $2-$4 per square foot. Drainboards and trivets are two ways to add style and function to your countertop. Drainboards are slatted areas that allow water to drain back into the sink. Trivets are raised slats that keep pots and plates from making direct contact with the counter. Both will require additional time to plan for and set and will cost more per square foot. Expect concrete countertops with drainboards and trivets to be at the higher end of the cost spectrum, around $100-$135 per square foot. One way to make a big statement is to install a concrete countertop inlaid with fiber optic lighting. Not every contractor has experience with this, but if you find one it will cost $125-$175 per square foot. Ambient Glow Technology (AGT) stones are available to add to the concrete aggregate. That means that when your countertop is exposed to light, the AGT stones will glow in the dark. One pound of AGT stones will cost $42 for materials. This does not include the cost of installation. Those stones will need to be placed by hand during the manufacturing process. If you want an irregular shape or curvatures in your countertop, it can increase your construction costs. Concrete countertops are built in a mold, and the mold may need to be built specially for your project. Your contractor will be able to provide an estimate for the cost of unusual shapes. Glass fiber reinforced concrete (GFRC), which is built on the same principles as fiberglass 5, is strong and is resistant to breaking down and cracking. The price is comparable to more conventional concrete, but it may not be recommended for countertops with a sink, as it can’t bear as much weight as conventional concrete. There are many people who claim that a concrete countertop is a weekend DIY project, but it really requires professional expertise if you want it done right. Inexperience can lead to cracks and damage from the outset of your project, in addition to a job that just doesn’t look professional. Concrete countertops are made from a mix of concrete and aggregate, which is usually sand and other binders. There is the possibility that your contractor could add more decorative elements like recycled glass or seashells as part of the aggregate. Some people like to use found items, but a 10-pound bag of recycled glass pieces costs about $30. Concrete is incredibly versatile, and you can add inlays and patterns to make the countertop more decorative, but this will add to the final costs. Concrete hardens quickly. Once the process starts, it cannot be stopped, so you need to be sure of all of your design decisions like color and decoration beforehand. You can’t just get a bag of concrete and make a countertop. It requires a mold, additives, and other tools. It is possible to do it yourself, but you won’t get the same quality that you would from a professional job. Clean-up after installation can be tedious, but your contractor should take care of most of that, which is another reason to employ a professional over the DIY approach. Are concrete countertops less expensive than granite? Not necessarily. Granite costs anywhere from $45-$200 per square foot, and concrete costs about $65-$135 per square foot. “Expensive” is a relative term, but the price is comparable to other slab countertops. Concrete countertops cost, on average, about $65-$135 per square foot. What kind of concrete do you use for countertops? Use a concrete with a high PSI (at least 6000). This will ensure that the concrete will be strong enough to hold up to the daily stresses that a kitchen countertop faces. How much does it cost to install a concrete countertop in my city? Cost to install a concrete countertop varies greatly by region (and even by zip code). To get free estimates from local contractors, please indicate yours.